I realize that I've had a lot of various giveaways on the Muse lately, but I guess I've just been in the spirit of giving. So when my blogger friend and Etsy shop owner Tara of Haute-Lunch asked if I would host a giveaway for her new store, I was more than happy to oblige! I remember a few months ago when I first started following Tara's blog. I'm not sure if she followed me first or vice versa, but I do know that I immediately fell in love with her blog's name. I mean: "haute lunch" -- how creative is that? Then I got to know her (in the virtual sense) and I found out that she is a totally awesome blogger with a very creative side. Now she's putting that creativity to good use with her own Etsy shop called Tara Lane Designs. Visit her shop for unique friendship bracelets, beaded necklaces and earring and even super cute adjustable rings. This is a ring she made me! Here is how you can enter to win any item from her shop valued at up to $15! I´m your follower: gondor Tari, and I´m a fan of her etsy shop: Laura Sánchez Murillo. My favourite item would be woven multi-chain bracelet. Two of my fav. people together! Yay! I loveeee all of them. Gosh, seriously! I'm a follower (YellowJade) and I really like thie pendant with turquoise beads. Thank you! so many great items on the etsy site...hard to pick. but i think my favorite is the Ribbon Earrings with Gold Chain. Thanks for your comment cute blog, lovely accessoires!! My favorite item is the Leather & Chain Bracelet - Woven Curb Link. i'd love the pearl ring! Hi, thank you for this nice giveaway! --- My fave item is the Woven Chain Bracelet in Gold/Red. i am loving your ring! and my fav item is the ribbion earrings with the gold chain! Woven Chain Bracelet is my fav! Glass Bead Ring with Adjustable Metal Band. 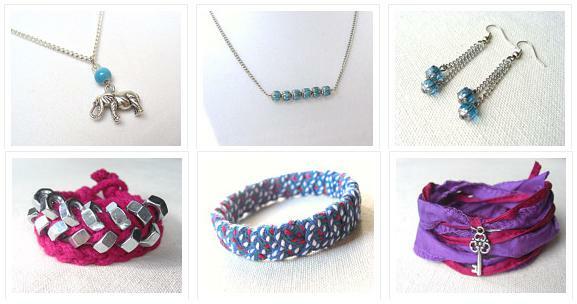 I also like the Elastic Hair Ties - Set of Three in Purple, Turquoise, and White. I love, love the leather wrap bracelet, the colors and the different textures are beautiful and creative. I added her shop to my favs on Etsy! :) Are you on there? I love everything! But if I could choose here are my top three loves! I would love to contact you about a Spot Light position. I follow on gfc and my favorite is the Woven Chain Bracelet - Blue & White with Silver Tone Curb Link. I like the Multi Strand Chain Necklace - Three Stand Silver Tone! My favorite item is the Sailor Knot Bracelet. I love the sailor knot bracelet. Google follower and love the multi-chain bracelet. Followed via GFC (Lanicha Wynn) and I like the Ribbon Earrings with Gold. The pink braided wrap bracelet is my favorite - so unique and such a gorgeous color-combo! The Friendship Bracelet - Chevron Embellished w/ Rhinestones - Multicolored is my favorite! And the shop is now a favorite of mine!